Stitchery! 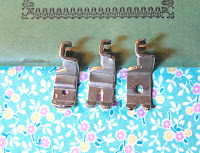 Sewing Machine Attachments, Needle, and Thread: Rufflers & Gatherers - What can be the difference? Rufflers & Gatherers - What can be the difference? Rufflers & Gathering Feet - Differences? I was recently asked, "what is the difference between a ruffler and a gatherer?". To myself (yes, I do talk to myself and respond accordingly), I began an explanation. Then I took at pause, and really started thinking - what is the major differences and how to best explain or show? With my gears turning, I turned first to my books and various attachment photos. 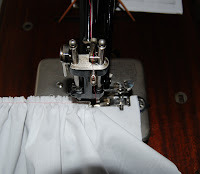 When I think of using the gathering foot, I think of shirring or smocking. The gathering foot gives me a subtle gather, then by sewing row upon row I create either shirring or smocking. Any material placed under the gathering foot will be slightly gathered. The stitch of the machine regulates the fullness of the gathers. Three gathers - different, but same results. This is smocking is created from the gathering foot - very subtle. This is shirring done with the gathering foot. The fabric does have a lot to do with how full your gather is. This is a nice little attachment to also use when easing in sleeves. Shirring is several row of gathers. These photos (above) show gathering done with a Shirring Foot. It has a slot where you place the top fabric (turned with the wrong side showing). When you finish, you have the middle photo. Now, if I used 100% cotton with the shirring foot, it would have less fullness. When I think of the ruffler, I now think of those ruffles on dresses, the bottom of sleeves. I can have very full ruffles in no time. I can also use the ruffler to create pleats (plaiting) in various widths. The control is on the ruffler. Here are some 1929 photos from Teacher's Textbook of Machine Sewing by Singer of pleating/plaiting. With the ruffler you can also do the ruffle and place on your garment at the same time - what a timesaver! Thanks for the question - it really gave me a pause and made me think just a little bit more. Not bad for a snowy, sleeting day. Happy Sewing! Thanks for the info...just bought a gatherer...and now need a ruffler! WOW! that was very involved and helped me understand so much more and the pictures! YES! I am so glad it helps. When someone asked me that question, I looked for a very short answer and as you can see, got much more involved!